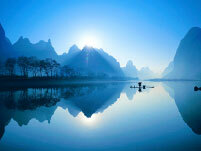 China Train Tour, Travel by train to Beijing Xian and Guilin, high quality China Tours ! 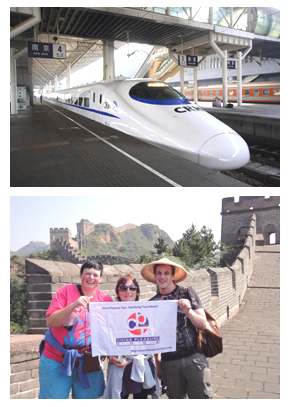 - www.chinatraintickets.net! Tour Type: Private land tour with well selected hotel, the cities connected by overnight comfortable Z train ( Soft Sleeper ) Private Guide and driver only for your family. You will see the most classic tour sites of China - Great Wall of Beijing, Terra Cotta Army Warriors in Xian, Li River Cruising and Elephant Trunk Hill Park, Etc. 2 Special Dinners. Visit the Coal Hill Park, wherer you can have a bird view of the Forbidden City. Then visit Tiananmen Square, the symbolical heart of China and gathering place for the masses. It is the biggest public square in the world, the Forbidden City as the Palace Museum, the Chinese imperial palace from the middle of Ming Dynasty to the end of the Qing Dynasty and the Temple of Heaven with its outstanding round shape, covered by an exquisite triple roof of blue tiles. 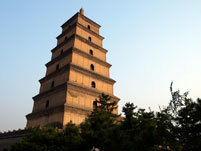 It is the place where the emperors of Ming and Qing Dynasty worshiped heaven and prayed for peace and harvest. After the whole day tour, dinner we preparted The Beijing Duck Dinner which served at the famous restaurant - Quanjude, Chairman Mao said we will pass Quanjude to our generations for ever during the Culture Revelotion. 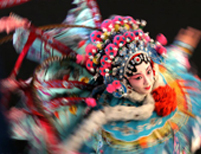 After Quanjude Duck Dinner, you will enjoy a lively Peking Opera performance ( or Kung Fu Show or Acrabatic Show ) at the Liyuan Theatre. Visit the Mutianyu Great Wall where is not too commerchial compare with Badaling Section ( You also can change to visit Badaling ) Located among the orchards and pines in the mountains to the north of Beijing, the Great Wall of China was constructed and reconstructed at Mutianyu to keep out the nomadic tribes to the north. Come to learn, touch, and explore the history of a Wall built over 300 years ago, yet which remains largely intact as it snakes endlessly across the mountain ridgelines. and the Sacred Way which means the road leading to heaven, Enjoy a walk along the Sacred Path leading to the necropolis. Visit the Ming Tomb of Changling, the largest one where emperor Yongle was buried. Although not excavated itself, it displays the artifacts found in the Ding Ling Tomb. 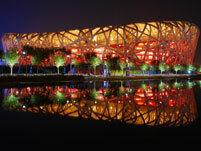 Visit the Bird's Nest and Water Cube 29th Olympic National Stadium, and the Summer Palace, built in 1888, it was once a summer retreat and the imperial park for emperors. Dinner before transfer you to the Beijing West train station. Take soft sleeper train to Xian in the night. 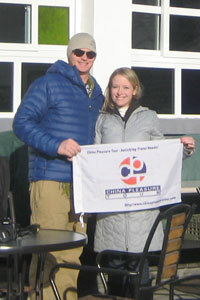 Our guide will pick you up at the railway station at morining and tranfer to your hotel. Breakfast at the local restaurant or KFC or McDonalds near the arrival train station. 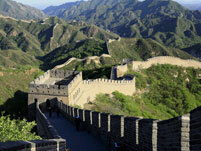 Visit the Terracotta Warriors and Horses Museum, the most significant archeological excavations of the20th century. It has been regarded as THE 8TH WONDER OF THE WORLD! . In the afternoon, visit the Great Mosque, is one of the oldest, largest and best-preserved Islamic mosques in China, the Muslim Street, Moslem Street is the hub of the Moslem community in Xian City. After visit Mulim street, you will hava a optional tour which is tour to Gao Yue Song’s ancient style Folk House, formerly high rank official during the Ming Dynasty some 300 years ago. This house won UNESCO Prize for Cultural Heritage Protection in Asian-Pacific Area in 2002 and you will be delighted to see a dying art: Shadow Play Opera which played by farmers. 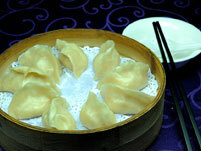 Dinner enjoy famous Dumpling Banquet . visit the Big Wild Goose Pagoda, which situated at south of the Xian city,as one of the main constructions in the famous Buddhist temple-Da-Ci-En Temple, the pagoda is one of the most distinctive and outstanding landmarks for Xian City, the City Wall, It is the most complete city wall survived in China as well as one of the largest ancient military defensive systems in the world, Shaanxi Provincial Museum, which is the largest comprehensive museum in the province. Dinner before transfer you to the Xian train station. 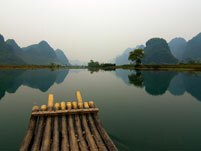 Take soft sleeper train to Guilin in the night. 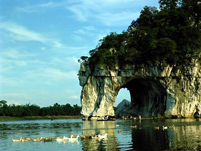 Arrive in Guilin in the late afternoon and our Guilin guide will pick you up at the railway station .Transfser to your Guilin hotel.